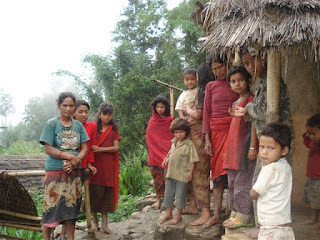 Today, I am going give you an overview of “Vaccine delivery” in remote high altitude areas of Nepal. As of now, I presume, each of us has received vaccination shots against common childhood illnesses. We must also remember that thousands and thousands of “unfortunate” children are still victim from infectious diseases at this very hour like measles, tetanus, cholera, which are otherwise easily preventable. My intention here is not to inspire or preach or convince you of what needs to be done. Instead, I am going to show you what I have personally observed and experienced the challenges while delivering vaccines in remote high altitude areas. First thing first, let me dedicate this blog post to those ladies, who are the foot soldiers for immunization in low income settings like Nepal. They are known as Female Community Health Volunteers (FCHV). They are directly involved in vaccinating the children in rural communities. Without them, immunization program would falter!! The focus here would be on the challenges that we face delivering vaccines in remote and high altitude areas. So, before jumping into vaccine delivery let me give you an overview of Nepal, which is a land locked country in South Asia. The estimated population is around 27 million. It is surrounded by two giants – China in the North and India in the East, West and South. It is divided administratively into 5 regions and 75 districts. It comprises 3 ecological zones that run from east to west – Southern Terai plain, Middle Hilly and High altitude Mountainous regions in the north. Altitude increases from south to north. There are 16 -districts in the mountain region. Among these 16 districts, my particular focus would a district named “Mugu” – this is one district which has the lowest human developmental index in Nepal. In Mugu, there is a district health office (DHO) at district head quarter. Its responsibilities lie in the provision of both curative as well as public health services. There is only one PHC below district level. And there are several health posts or sub health posts in every village development committee (VDC), which is the lowest government administrative unit. Under each health post or sub health post, there will be FCHVs, Outreach Clinic (ORC) clinics and Expanded Program on Immunization (EPI) ORC that function to provide public health services in the community. DHO is therefore a command centre for all public health activities. In remote districts like Mugu, the sustainability of energy requirement and transportation of health commodities are of the highest priority to the district management. Once we have commodities like vaccine or delivery kits, it cannot remain in district headquarter. These have to reach people and if it is vaccine in particular, then it has to reach the children at the earliest since it has to be kept cold within required temperature. Energy is scarce in this part of the world. The basic source of energy here is firewood. This does not help them maintain cold chain temperature for vaccine. Next nearest energy source is kerosene, which is very expensive and it is difficult to sustain for the whole district. So the next reliable source would be either solar or wind or hydro energy. Here in Mugu DHO, the source of energy is only solar energy. There is no reliable electricity source as of now. As we are aware by now, the cold chain maintenance of vaccine is of highest importance in vaccine delivery. If we fail maintain it properly due to various reasons – human or technical error, we are committing crime to humanity. You may ask,” Why is that?” It is primarily because vaccinating a child with “impotent” vaccine is as good as giving child a poison. Therefore, the continuous monitoring of temperature and documenting those numbers is very important. However, our experience based on field observation or monitoring visit tells that this is not always done. More than technical errors, we have observed that it is in majority of cases due to human factors and partly technical. This is one area many research organizations are utilizing their innovative ideas that can address and solve both human as well as technical limitations in the system. The primary goal of EPI is to deliver safe and effective vaccine to the children of every country, every province, every district and every village. Apart from it, we also need to realize that getting vaccinated is the birth right of every children and delivering complete dose of vaccine thereby fully immunizing them. Therefore, reaching every child is has to be our mission and we all have a moral responsibility to achieve this mission. But a very practical question comes to us, “Are we able to achieve these objectives?” This is challenging but is also doable. Why sort of challenges do we have to face. Look at the picture (above) – these are vials of oral polio vaccine (OPV) given to protect child from “paralyzing” poliomyelitis. Unfortunately, we found in one of field inspection that many vaccine vials had to be discarded because Vaccine Vial Monitor (VVM) showed stage 4, which means they are damaged due to excessive temperature exposure. So you may ask, “Why does it happen?” It has various reasons, as a result of human as well as technical limitation in those areas. One of the main reason, many of times, we find vaccine carriers – old, leaky and dilapidated conditions. Another aspect of challenge in the delivery of vaccines is high drop out that leads to incomplete dose(s) of vaccine received by the child. In this, the role of mothers, health workers, community leaders, engineers, volunteers, teachers and students are vital. Another important target for vaccination, which we tend to miss from getting them vaccinated, is all new borne babies. They are highly prone to infectious diseases. Many of times, thousands of babies are still home delivered in low income settings. Therefore, we need to serve these family and community living in hardest to reach area of any geography the most. This is one challenge that every government in low income setting are trying to solve to serve the most impoverished population and save children from preventable diseases. There are parents, family or community, who will vaccinate their children but are busy with family works because they have to worry about what to eat next day more than getting their child vaccinated. There are some children, who are in the wild playing happily. Many of them are “Zero Dose” which means that they have not received even a single dose of vaccination. There is another socio – economic aspect of a community which does affect the health of the family as well as to reach them. In South Asian society, there still exist millions of people considered “untouchables”. These people are perennially pushed at the lowest of low in the socio – economic strata. The children from these communities are usually those who are either “Zero Dose” or “incompletely” vaccinated. And it is in this community, where most of the disease outbreak occurs. So as a vaccinator or local public health manager, s/he has to face a practical question – how do we reach these children and vaccinate them? Vaccinator has to think – how to reach there? She has to think – do I need to travel on foot or on horse and is “per diem” covered or am I insured? Many of times, these field level health workers have their own social responsibilities like we do. I have to say, these are real public health dilemma that many of field level health workers have to go face because, on the other hand - if s/he does not carry out her duty well, then somewhere, an “unfortunate” child may get diseased or even lose his/her life!! In remote and high altitude areas, we need to walk for hours and hours to reach from one village to another. There is no other option. This is going to be your daily routine, if you decide to live there or serve these people. Sometime, we have to risk our lives. Many health professionals have lost their life while in duty. Therefore, most of the time, vaccine transportation is through human vehicle, walk for many hours to days even up to 10 days in some places. It is definitely heavy and painful, while paid less and walk for days to reach these children and vaccinate them. We have to acknowledge, the office helpers, who are indispensable in carrying out vaccination program in these remote high altitude areas. Sometime it is not easy to carry so they have devised a local method – carry it on your, shoulder, back or head.